What is money? Where does it come from? Why are people currently exchanging pieces of paper for goods and services? Why is this paper in demand? These are crucial questions you might not have asked yourself, but their answers have a major impact on your life. Money, markets, and economics are portrayed as subjects too complicated for the average person to understand. This notion isn’t true, but it does serve the interests of those in positions of power. Economics is the study of human action and a market is voluntary human action. The purpose of a market economy is to fulfill the needs and wants of individuals by allocating resources through voluntary exchange. One of the most critical concepts within a market economy is money. Money is a market invention that simplifies trade and makes cumbersome barter obsolete. Money is a common medium of exchange which saves time and labor during trade, thus increasing the standard of living. Logic dictates that the ideal form of money should be durable, divisible, portable, fungible, scarce, and in demand for purposes other than a medium of exchange. Market supply and demand dynamics demonstrate that precious metals, specifically gold and silver, meet these criteria better than any other good. Many people voluntarily chose to use gold or silver as money throughout history for this reason. However, today the world operates under a system called fiat currency. Currency is a temporary substitute for money and is typically redeemable for money. Currency is distinct from money because while currency is durable, divisible, portable, and fungible; it is not significantly scarce or in demand for purposes other than a medium of exchange. Examples of currency are paper notes, tokens, or electronic digits which do not have much demand other than as a medium of exchange. In contrast, gold or silver are in high demand for many applications including electronics, medicine, construction, aerospace, dentistry, and jewelry. Fiat currency is irredeemable currency that has been made a permanent substitute for money due to threats of violence from “government” (a euphemism for men and women in costumes forcing you to obey their arbitrary commands). These threats take the form of “legal tender laws” as well as “taxation” which is collected in the form of fiat currency. These threats give fiat currency artificial demand which would not exist otherwise. So who has the power to create fiat currency? The answer is central banks. Central banks are banking cartels that have a “government” granted monopoly on the creation of fiat currency. In the United States, it’s the Federal Reserve System (the Fed). In the United Kingdom, it’s the Bank of England (the BoE). In Europe, it’s the European Central Bank (the ECB). In Japan, it’s the Bank of Japan (the BoJ). The model is the same across the world. Central banks loan fiat currency (Federal Reserve Notes, Pounds, Euros, Yen, etc) into existence. 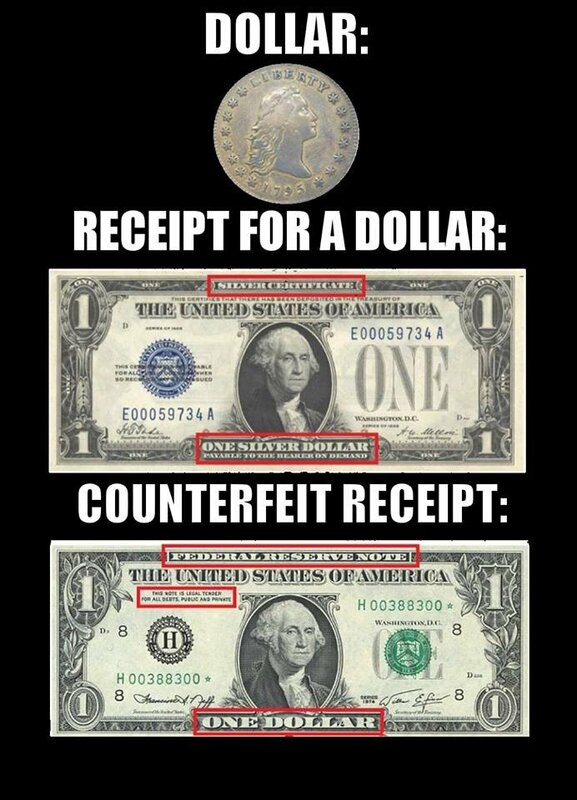 These fiat currencies often bear the name of money, such as the Federal Reserve Note bearing the word “dollar” (which is by definition a weight of silver), but they are not money. To put it simply, central banks run “legalized” counterfeiting operations with the protection and enforcement of “government.” Counterfeiting is theft because it steals purchasing power from the current holders of the currency or money and transfers it to the counterfeiter. 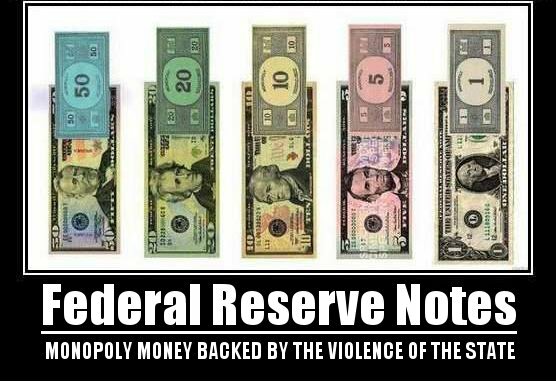 The Fed has stolen approximately 95% of the purchasing power from the users of the Federal Reserve Note since its creation in 1913 and other central banks have similar track records. Unfortunately, that’s just the tip of the iceberg. Central banks use their counterfeiting rackets to rig interest rates, bailout their cronies, fund the welfare state, fund the police state, fund the warfare state, create asset booms and busts, and stifle economic growth. You pay for all of this through lost purchasing power, whether you want to or not. So what can be done about this? The power rests in your mind. The system can be brought to its knees with a mass change in consciousness. You should be free to choose what you want to use as money, rather than a fraud being violently imposed on you by central banks and “government.” Freedom, not slavery, must determine which goods are best suited for money. Various goods should compete for market share. In the past, gold and silver have come out on top, but that doesn’t mean they should be forced on people either. It’s possible that crypto-curriences like Bitcoin would gain a large market share alongside gold and silver. Or perhaps gold and silver backed crypto-curriences would emerge. To help achieve this, educate yourself and others about the current fraudulent monetary system and refuse to use fiat currency to the maximum extent possible. Destroy the Fed and its supporters! Read The Creature From Jekyll Island.